ATLANTA (December 13, 2018) — Spelman College has received the largest gift from living donors in its 137-year history from long-standing Spelman trustee Ronda Stryker and spouse William Johnston. The transformative $30 million gift will help build the Center for Innovation & the Arts, the College’s first new academic facility since 1996. 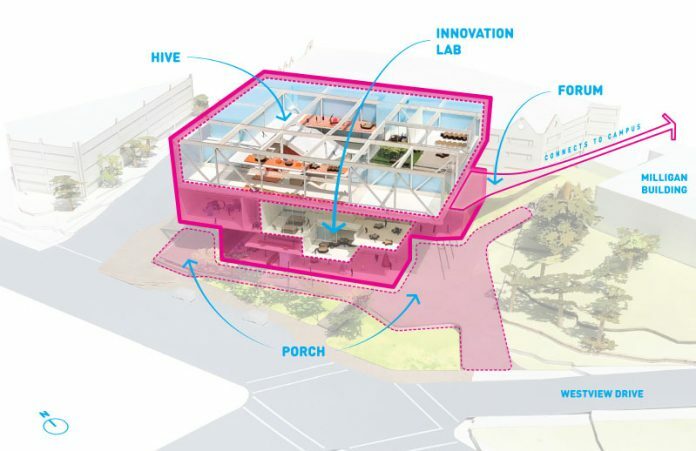 Chicago architect, Jeanne Gang, founding principal of the firm Studio Gang, has completed a schematic design of the 85,000 square footbuilding that will occupy a current parking lot at Spelman at the corner of Westview Drive and Lee Street. Stryker has been a trustee of Spelman since 1997 and currently serves as the vice chair of the Spelman College Board of Trustees and chair of the Board’s Arts, Innovation & Technology Committee. Consistent and extraordinary giving from the Stryker family has had a significant impact on Spelman. Their gift to establish the Gordon-Zeto Center for Global Education, for example, funded the expansion and ongoing operation of the College’s study abroad program. As a result, the Institute of International Education’s Open Doors report notes that Spelman sends more Black students to study abroad than any other baccalaureate college in the country with 75 percent of its 2018 graduating class having studied abroad. Support from the Stryker family has benefitted numerous other Spelman initiatives, including the Spelman College Museum of Fine Arts, science initiatives, summer internships, the Annual Fund, the President’s Safety Net Fund, and renovations to Sisters Chapel and the Wellness Center at Read Hall. Including the generous gift from Stryker and Johnston, the College has raised more than one-third of the total cost of the CI&A, which received its first support from Leonard and Louise Riggio in 2016. 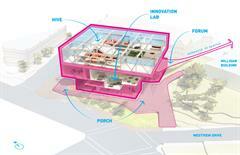 The cost of the new facility, which includes an operating endowment and state of the art technology, is $86 million. The CI&A enables the College to bring together in one building its considerable strength in STEM with its award-winning programs in the arts. The hub of the building will be the Innovation Lab, co-directed by Brown-Simmons Professor of Computer Science Jerry Volcy, Ph.D., and Associate Professor De Angela Duff, MFA, whose work sits at the intersection of art, design, and technology, in consultation with Senior Adviser Topper Carew, Ph.D., a visiting scholar at the Massachusetts Institute of Technology Media Lab. For the first time in the College’s history, the same building will house all of Spelman’s arts programs – art, art history, curatorial studies, dance, digital media, documentary filmmaking, photography, music and theater. A major feature of the building will be its “Front Porch,” an element of the design that opens up the entrance of the CI&A to the Westside community and offers a set of ground floor amenities. They include an expansion of the award-winning Spelman College Museum of Fine Art, a digital theater housing publicly accessible performances, technology events, film screenings and a cafe. A schematic of the CI&A demonstrates the innovation and intentionality behind creating a unique interdisciplinary environment. The facility will offer different scales of gathering and assorted modes of connecting and collaborating for learning and risk taking in the liberal arts. Several distinguished faculty have joined Spelman in the past three years either as permanent or distinguished visitors. They include photographer Myra Greene, filmmaker Julie Dash, director/performer/choreographer Aku Kadogo and playwright Will Power. Art historians and curators, Cheryl Finley, Ph.D., associate professor at Cornell University, and Lowery Stokes Sims, Ph.D., former curator at the Metropolitan Museum of Art and former executive director of the Studio Museum in Harlem, serve as senior advisers to the Art History and Curatorial Studies Collective. Andrea Barnwell-Brownlee, Ph.D., also a member of the Art History and Curatorial Studies Collective and director of the Spelman Museum, was recently named Atlanta’s Best Curator by Atlanta Magazine. Founded in 1881, Spelman College is a leading liberal arts college widely recognized as the global leader in the education of women of African descent. Located in Atlanta, the College’s picturesque campus is home to 2,100 students. Spelman is the country’s leading producer of Black women who complete Ph.D.s in science, technology, engineering and math (STEM). The College’s status is confirmed by U.S. News and World Report, which ranked Spelman No. 51 among all liberal arts colleges and No. 1 among historically Black colleges and universities. The Wall Street Journal ranked the College No. 3, nationally, in terms of student satisfaction. Outstanding alumnae include Children’s Defense Fund Founder Marian Wright Edelman, Starbucks Group President and COO Rosalind Brewer, former Acting Surgeon General and Spelman’s first alumna President Audrey Forbes Manley, global bioinformatics geneticist Janina Jeff and authors Pearl Cleage and Tayari Jones. For more information, visit www.spelman.edu.